Home to some of the richest food in Europe, Switzerland and Austria make for the perfect gastronomic tour. Filling up on the world’s best chocolate and cheeses in Switzerland may feel hard to beat, that is until you have tried apfelstrudel in an Austrian cafe. Linked at the hip, Switzerland and Austria are full of scenic mountains, lakes, and villages. 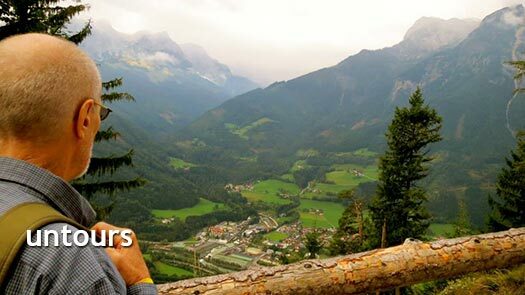 Two-time Untourists, Alice and James Wootton, spent last October eating and hiking their way about Switzerland and Austria. Below is a photo blog of all the beautiful sights and delicious foods they enjoyed on their Untour. The view from their Untours apartment in Ticino, Switzerland looking over Lake Maggiore. Hiking atop Cardada, looking out over Lake Maggiore where the town of Locarno nestles. Picnicking next to Lake Lugano enjoying locally made salami and cheese purchased at the Locarno farmers’ market. After their picnic Alice and James enjoyed a walk along the Olive Path in the adjacent town of Gandria. The view from Monte Bre, overlooking Gandria. Ripe for walking! Getting a bit lost in Monte Bre can’t be too bad with views like this! Plenty of waterfalls and valleys to discover in Sonogno, Switzerland. One village over in Frasco, James and Alice braved this pedestrian suspension bridge. Breakfast in Locarno, Switzerland? We’ll take these treats from Manor’s in Locarno anyday! Final day in Switzerland was actually spent in Connobio, Italy, which is right across Lago Maggiore from Locarno! On to Austrial, where the Woottons woke up to this beautiful view outside their Untours apartment in Kuchl. Does this collection of Austrian foods the Woottons ate even need a caption?! Transportation of choice in Kuchl, Austria. An adorable house in Kuchl, Austria. Sound of Music Tour through Salzburg, Austria! Riding out of the old city and into the beautiful countryside. Time to study! Between Switzerland and Austria, a German Phrasebook is an Untour must-have. Near Salzburg, in Golling An Der Salzach, this cow wears a headdress which has been passed down for generations. Thank you again to Alice and James for sharing their trip photos with the Untour community. If you’re interested in an adventure like the Woottons’ then see our Austrian and Swiss Untour information here.